The idea of flipped classrooms emerged from a 1993 publication by researcher Alison King called “From Sage on the Stage to Guide on the Side.” While the work did not explicitly call for the use of “flipping” classrooms, it did call for the use of class time to give meaning to the information students learn. For this assertion, King’s work is often considered the foundation for flipped classrooms. There is no unilateral consensus on what constitutes a flipped classroom. Rather, the definition is expansive, and can describe nearly any structure in which lectures are pre-recorded and received at home and activities are facilitated during class meetings, thereby flipping the traditional class set-up. Instead of lecturing during class time, instructors typically function as facilitators. They might use the time in-class to clarify information from the at-home lectures or to gauge student understanding and growth through various activities. Other instructors might only adopt some elements of the flipped classroom model, or to only flip some classes during the semester. The model is highly adaptable and able to suit a variety of class environments. In addition, for students with disabilities such as a hearing impairment, or for students for whom English a second language, having additional time to learn material before accessing and utilizing the information they have learned in class can be crucial. Using classroom meetings to practice applying a concept can help instructors to guide learning, and to help students to self-assess and redirect their focus. While there are significant benefits to the flipped classroom model, there are also some difficulties that may arise. For one, flipping the classroom requires significant preparation on the part of the instructor. Not only do they have to pre-plan and record their lectures, they also have to utilize technology to make them available to students and troubleshoot any errors that may arise. If their chosen technology fails, the student may not be able to receive the lecture, and will be unprepared for class. One some level, this is inevitable, but at the same time, it can disrupt student learning and derail class meeting time. 2. Bishop, J. L., & Verleger, M. A. (2013, June). The flipped classroom: A survey of the research. In ASEE National Conference Proceedings, Atlanta, GA (Vol. 30, No. 9, pp. 1-18). A concept map (or mind map) is a visual tool to help a learner organize and represent what he or she knows. They include concepts, usually enclosed in circles or boxes of some type, and relationships between these concepts indicated by a connecting line linking two concepts. Words on or between the line, referred to as the linking words/phrases, explain the relationship between the two concepts. There are many kinds of concept maps. Perhaps the most common are: hierarchical concept maps, spider concept map, and flow charts. Hierarchical concept maps demonstrate the hierarchy between concepts. They start with the most important topic at the top that will be used to organize all the other content (e.g. “Presidents,” “Science Games,” or “Environmental Policy”). Then additional concepts are written, connected with lines (often with arrows to show directionality of the relationship). For instance, relationships like A causes B (“sugar causes cavities”) or A includes B (“Presidents include Abraham Lincoln”) can be visualized with a concept with an arrow pointing to another concept, and a relational word in between. Spider concept maps have the keyword in the middle as a central concept, with various sub-topics that branch out. These sub-topics also have additional sub-topics, and so on. Flowcharts are diagrams that lead the viewer down various branching paths based upon conditions. For example, a flowchart to diagnose the root cause of a technical problem may ask: “Is the warning light flashing?” Yes / No. The flowchart can then branch two or more different directions based upon whether something is true or false. By following the path of a flowchart to beginning to end, the viewer can reach a certain conclusion. Concept maps are closely related to constructivist learning theory, which posits that learners actively construct new knowledge; discovery learning theory and David Ausubel’s theory of meaningful learning. Joseph D. Novak developed concept mapping in 1970s at Cornell University to capture students’ emerging science knowledge. His work is based on Ausubel, who underscored the importance of prior knowledge for learning. Concept maps are an excellent way to improve common ground between people. For example, a teacher can ask students to create various concept maps to demonstrate their current understanding of various topics. Learners can create Personal Learning Network Maps (based upon connectivist learning theory) that can demonstrate all the various sources of knowledge that they use to learn. 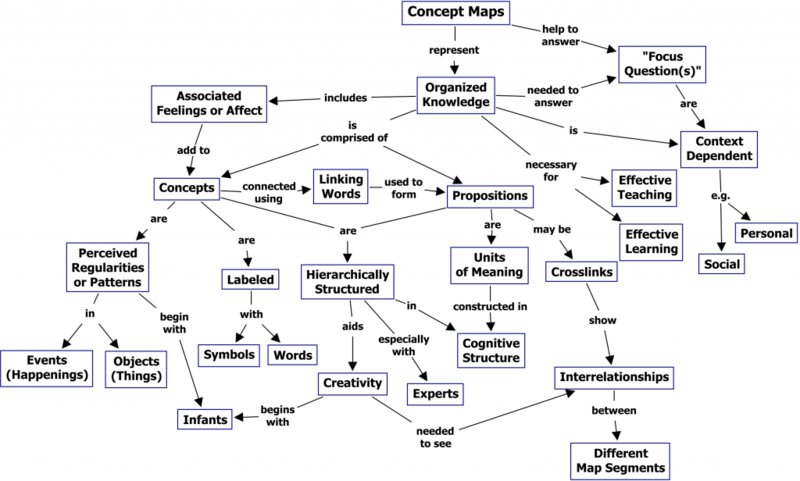 Students can create concept maps while working on a research project to help keep track of their knowledge of a research topic or to help outline a research paper. Students of English or foreign language courses can create vocabulary word maps to demonstrate the relationship between various words, definitions, word roots and affixes. Poplet – an excellent mind map creation tool that also allows images, hand drawn sketches, and YouTube video clips. Also supports collaboration, making it useful for group work or for teacher support. CMap Tools – a popular mind map tool developed by the Institute for Human and Machine Cognition. Redford, J., Thiede, K., Wiley, J., & Griffin, T. (2012). Games can be useful tools for education — they are fun and engaging experiences that can teach a wide variety of skills and concepts! They come in a wide variety of formats, including digital games (mobile, console, video games) and tabletop games (card games, board games, collectible trading card games). Practicing valuable skills. Games provide opportunities to practice important skills such as creativity, problem solving, planning, and strategic thinking. Social interaction with friends, family or peers. Quality time can be hard to find — games can provide a memorable bonding experience. Short length of time needed to play. Tabletop games don’t require a huge time commitment – usually 30 minutes to a few hours. Relatively low cost. Board games tend to be fairly cheap — usually ranging from $10 to $30, making them a good value. What are some examples of games that are great for learning? Apples to Apples Junior – The Game of Crazy Combinations! – a funny party game involving word associations — quickly choose a word (red apple) that matches an adjective (green apple). The judge for that round chooses the best match. This game is useful for English Language Learners (ELL). You can buy the game for about $10 here. Timeline American History Game – a fun game in which players take turns trying to place famous events in history in the proper place on a timeline. 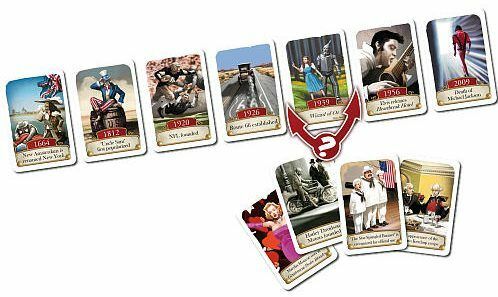 Each card contains events in American history, or scientific discoveries and other important events — when did the American Civil War begin? When was electricity discovered? You can buy the Timeline Game here for about $10-15. What about making your own card games? Our recommendation is a free tool called Card Game Toolkit. CardGameToolkit.com is an excellent tool for making your own custom printable educational card games and paper-based tools. You can quickly make various creations, download them, and then print them out. You can also try out other peoples’ creations. Choose a card template. You can choose a card front and back, or make it one sided. 2. Add images and resize/place them onto your card. Make sure your images are not copyrighted, or else your work cannot be featured on our website. 3. Add, move and format text. You can change color size, color, and other formatting options. 4. Add a card to your deck. Once a card is made, it’s easy to duplicate and modify additional cards. Be sure to make several cards (a complete deck). 5. Save your deck and provide details. Write a short description about your deck, including the subject area and any instructions, rules and guidelines. Right now, we are running a contest: create an educational card game — share it with our community — and win $100! We want you to “put your best deck forward” and see what kind of creative or fun materials you can come up with! Create a card game or educational learning tool that students can use to learn either at school or at home. You can submit as many entries as you wish. You are encouraged to share your creation to others and have them rate or review your game/tool. Deadline for Entry: December 15, 2016. Entries will be judged based upon criteria: useful for education, design, peer rating, and overall quality. Winner will be announced by December 31, 2016 on Learning-Theories.com and awarded a one time Paypal payment. Submissions must be original. All Submissions become the property of Learning-Theories.com. You will receive credit as being a contributor. As all submissions will become hosted on our site, we reserve the right to modify, edit, delete or sell your creation. Go on and make a deck! Go to CardGameToolkit.com and then come back here to submit your entry. All submissions become the property of Learning-Theories.com. We reserve the right to modify, edit and sell your creation. (a) Work Product. During the course of submitting to the the Educational Card Game Contest (Contest), the Contributor in conjunction with Learning-Theories.com (Company), develop information, produce work product, or achieve other results for Company. (b) Ownership. Contributor agrees that such information, work product, and other results, systems and information developed by Contributor and/or Company (hereinafter referred to collectively as the “Work Product”) shall, to the extent permitted by law, be a “work made for hire” within the definition of Section 101 of the Copyright Act (17 U.S.C. 101), and shall remain the sole and exclusive property of Company. (c) Assignment of Interest. To the extent any Work Product is not deemed to be a work made for hire within the definition of the Copyright Act, Contributor with effect from creation of any and all Work Product, hereby assigns, and agrees to assign, to Company all right, title and interest in and to such Work Product, including but not limited to copyright, all rights subsumed thereunder, and all other intellectual property rights, including all extensions and renewals thereof. (d) Moral Rights. Contributor also agrees to waive any and all moral rights relating to the Work Product, including but not limited to, any and all rights of identification of authorship and any and all rights of approval, restriction or limitation on use, and subsequent modifications. (e) Assistance. Contributor further agrees to provide all assistance reasonably requested by Company, both during and subsequent to the Term of this Agreement, in the establishment, preservation and enforcement of Company’s rights in the Work Product.